Leading innovative market research services provider Civicom is hosting a webinar on app-based mobile ethnographic research and how market researchers can make the most out of the features of the new and improved ThoughtLight®, a leading edge mobile insights app designed specifically for the needs of qualitative the market research professionals. The webinar will be featured in several time zones on September 26, 27, and 28. Civicom Marketing Research Services, long-time innovator of marketing research solutions, bridges the gap between researcher interest in collecting insights and the ability to collect those insights through respondent self-managed research via ThoughtLight™, Civicom’s internally developed mobile qualitative app launched in 2016. Thoughtlight™ is an intuitive and flexible tool for researchers who want to maximize engagement with respondents using mobile devices. The feature-rich app, available in iOS and Android, enables qualitative researchers to capture real-time respondent insights through audio diaries, patient journeys, mystery shopping and B2B studies, while fully eliminating the need for costly and time consuming travel. ThoughtLight™ provides the option for collecting geolocation on every activity plus off line accessibility for places with no data connection. Researchers can also encourage respondents to participate even more proactively through push notifications, encouraging respondents to fully complete their assigned research activities through the app. ThoughtLight™ can also be combined with Civicom’s other market research solutions, such as Civicom Chatterbox®, an advanced online community platform as well as CyberFacility® for virtual IDI and Focus Groups, and See Me Navigate™ for mobile usability or UX testing. 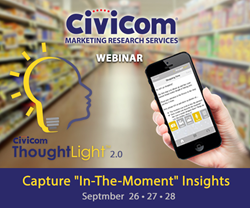 Attendees of the webinar, entitled “Civicom ThoughtLight™ 2.0: Capture ‘In-The-Moment’ Insights”, will see ThoughtLight™ in action and learn about making the most of the app’s robust features for gathering genuine feedback. Ross Rodriguez, ThoughtLight Project Manager, will also tackle added app improvements that will enhance both the researcher and respondent’s experience in using the app. Civicom Marketing Research Services offers many options to enhance the research process for marketing research professionals. Civicom is the global leader in facilitating telephone and web-enabled in-depth interviews and focus groups using Civicom CyberFacility®. Civicom also offers Civicom Chatterbox®, an asynchronous research platform for online communities and bulletin boards. Civicom operates in over 96 countries and offers extensive translation services for marketing researchers, as well as transcription services through TranscriptionWing™, and market research respondent recruiting through CiviSelect™. All of these services are available in Spanish, as well as English, and multiple other languages.